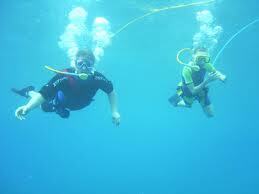 This diving experience takes you beyond the coast and out into the vast and magnificent Pacific Ocean. You will be taken, by boat, to one of several great diving sites where you will get to explore the world beneath you. This excursion is limited to smaller groups, so you will have more of a personalized experience. Your guide will be with you the whole time in case you have questions or need help with anything! This diving experience is truly something special. Minimum age is 15 years old Remember to bring your camera. Bring or wear a swim suit & towel, and also sunscreen. IMPORTANT: Please be advised that if you have a history with any of the following problems: heart, lung, epilepsy or seizures, decompression sickness, ear or if you are more than 3 months pregnant you will need to request the waiver prior to your trip for a physician approval.